A clear soup with colorful vegetables and alphabet noodles. Stir the content of this package with a wooden spoon in 4 1/4 cups of boiling water. Cook over medium heat for 8 minutes. Stir occasionally. 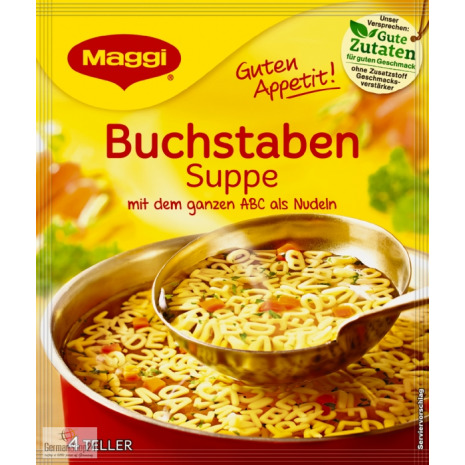 84% pasta (DURUM WHEAT SEMOLINA, WHEAT FLOUR), iodized salt, flavors (with WHEAT, BARLEY, CELERY OIL), sugar, herbs (parsley, celery leaves, lovage leaves), 0.5% carrots, spices (coriander, pepper, turmeric extract, nutmeg), onions, sunflower oil, palm fat, salt, seasoning (from WHEAT), acidifying agent (citric acid). May contain traces of eggs, milk, mustard and soy. 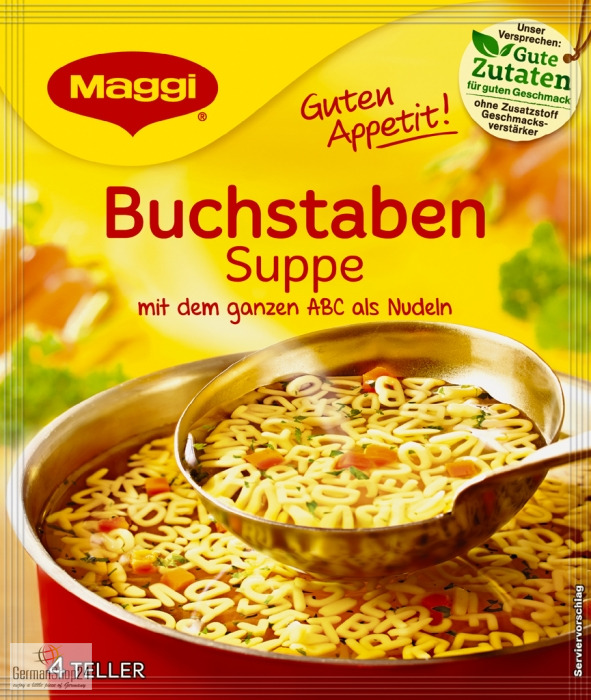 84% Nudeln (HARTWEIZENGRIESS, WEIZENMEHL), Jodsalz, Aromen (mit WEIZEN, GERSTE, SELLERIEÖL), Zucker, Kräuter (Petersilie, SELLERIEBLÄTTER, Liebstöckelblätter), 0.5% Karotten, Gewürze (Koriander, Pfeffer, Kurkuma, Muskatnuss), Zwiebeln, Sonnenblumenöl, Palmfett, Salz, Würze (aus WEIZEN), Säuerungsmittel Citronensäure.